International Jet has received its second consecutive Diamond Award Of Excellence for aircraft maintenance for 2018. In October 1991, the Flight Standards Service Aircraft Maintenance Division (AFS-300) determined there was a need for an incentive program to encourage AMT employees and employers to participate in initial and recurrent maintenance training/courses. 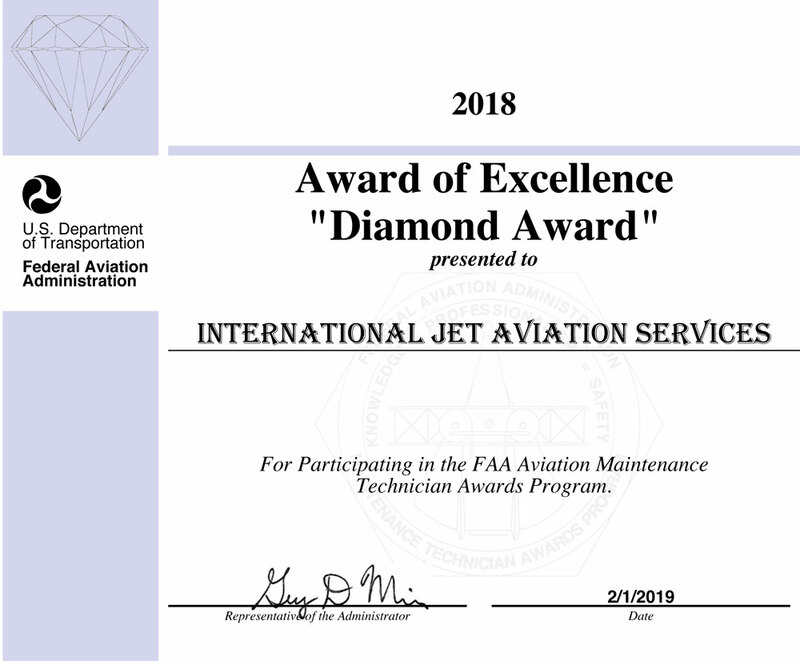 There are individual awards as well as an employer award and were proud to say International Jet/Premair Jet Management’s maintenance department received another Diamond Award of Excellence! This is the highest level of an award in this program. An eligible employer must have 100 percent of its eligible employees receiving an individual William (Bill) O’Brien Award over the past recent calendar-year to be eligible to receive special recognition in the form of an AMT Diamond Award of Excellence. Congratulations to our Maintenance Department for continuing to dedicate the time to complete these on-going training programs! Be sure to also check out what makes us an industry leader in Aircraft Management.